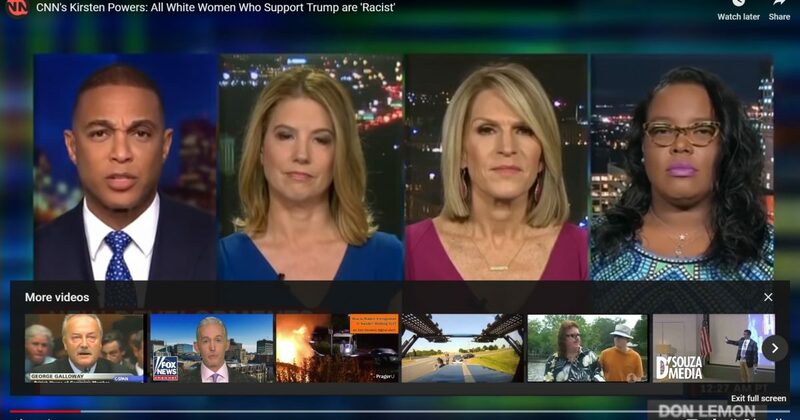 CNN resident racist Don Lemon ran a segment asking the same question he asks about seven times a day, why white women support President Trump. Powers replied, “Well, I think there’s a lot of different ways that we have to look at this. I think one of the first things is that people will say that they support him for reasons other than his racist language, which we don’t have time to go through but there’s all sorts of things, starting from the launch of his campaign all the way up until the latest campaign, the way he demonized people trying to come to our country on the caravan. They’ll say, ‘Well, I’m not racist. I just voted for him because, you know, I didn’t like Hillary Clinton. And I just want to say that that’s not – that doesn’t make you not racist. It actually makes you racist. If you support somebody who does racist things, that makes you racist. So, I just want to establish that. As for why white women do it, I think we have to recognize that white men are doing it as well, but I think sometimes we would hope that we would get better behavior from white women, because white women are themselves oppressed and that they would, therefore, be able to align themselves with other oppressed people. How about this, Kirsten? What if I don’t believe @realDonaldTrump is a racial demagogue? I sincerely do not. I also know my own heart is not filled with hate/discrimination for anyone, and I am not racist.Every word DJT says abt illegal imm has also been said by Dems <10yrs ago. Totally NAILED IT. And she WORKED for that woman as well. Powers is a total hypocrite but then again what do you expect from most of the Left. Always the “do as I say not as I do” crowd. She used to be tolerable..she used to defend her party talking points/ marching orders well…then something happened and she either quit trying or just got self consumed with hate. I feel sad that you feel marginalized at all. You should feel free, cuz you are! 600k Americans died 150 years ago so we can all be free together. The price was paid in blood. To say that anyone is racist based on a vote, and not their character, or quality as a human being is the most irresponsible, moronic thing I’ve ever heard spoken. You lump an entire group of people based on nothing other than your own narrow beliefs. Moronic beyond belief. Yup, that perfectly defines Kirsten's ignorant and irresponsible copy paste of #IdentityPolitics & #intersectionality dogmas. One would expect her to be smarter but… well, I guess she's not capable of thinking for herself. That was the stupidest thing I've read all day.